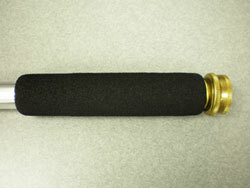 Manitowoc, WI- Dramm has begun shipping Handi-Reach Handles with its new EPDM rubber grips. The new grips are soft and insulate your hand from the cold water, easing hand watering. For more information please email us or contact us at the numbers to the left for more information.